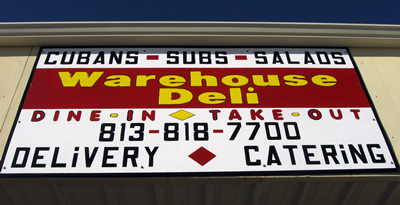 The Warehouse Deli offers a wide selection of delicious delicatessen food in a friendly, small, hometown atmosphere. Dine at our deli on 141 Stevens Avenue, order Delivery by calling us at 813.818.7700, or let us Cater your next function or business meeting. You can now follow us on Facebook for daily specials, updates, and other information from Warehouse Deli.